Female 29 yo, getting big neck faster. Last year she got some small colloidal cyst on right lobe. But at this time ultrasound detected hypoechoic mass on right lobe, #34x60x24mm with many small cysts inside, calcified and hyperechoic nodules and vascular network between cysts which was thought to be colloidal cysts. 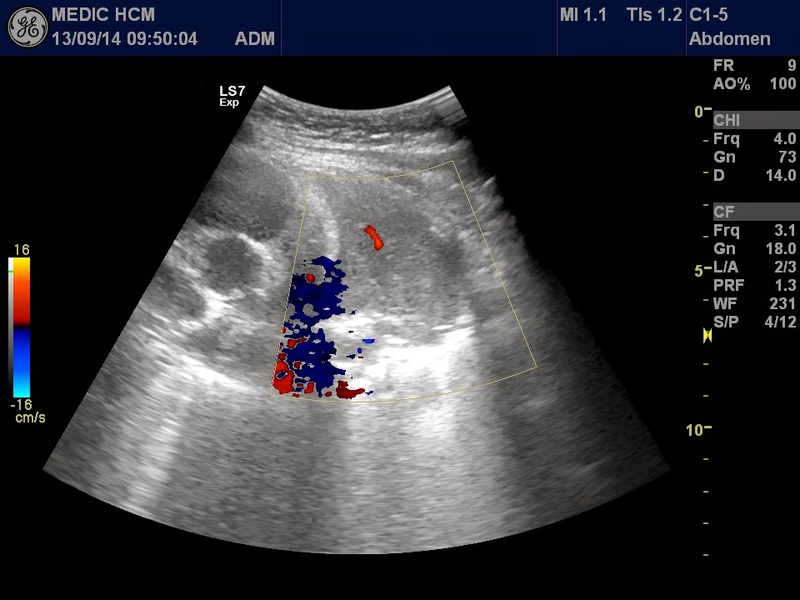 With elastoultrasound ARFI, lesion was harder than the surrounding, black color on VTI and blue code on Esie Touch. Elastographic velocity was higher , V=2.7à 3.14 m/s than the surrounding, v=1.28m/s. It suggested a malignant lesion on elastographic US. 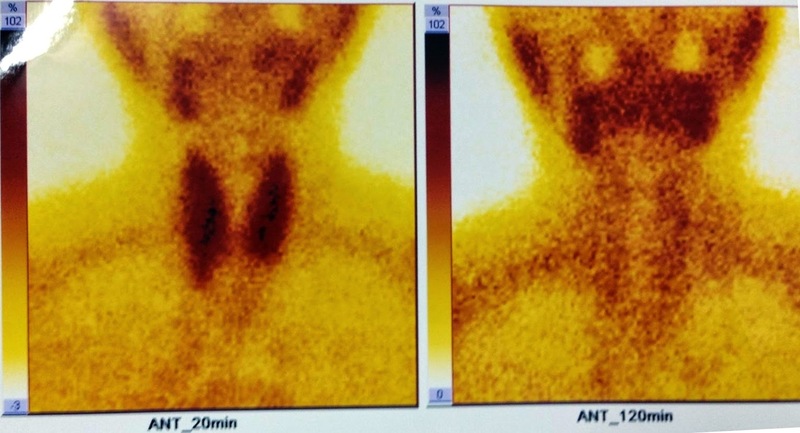 Microscopic result of FNAC was PTC. 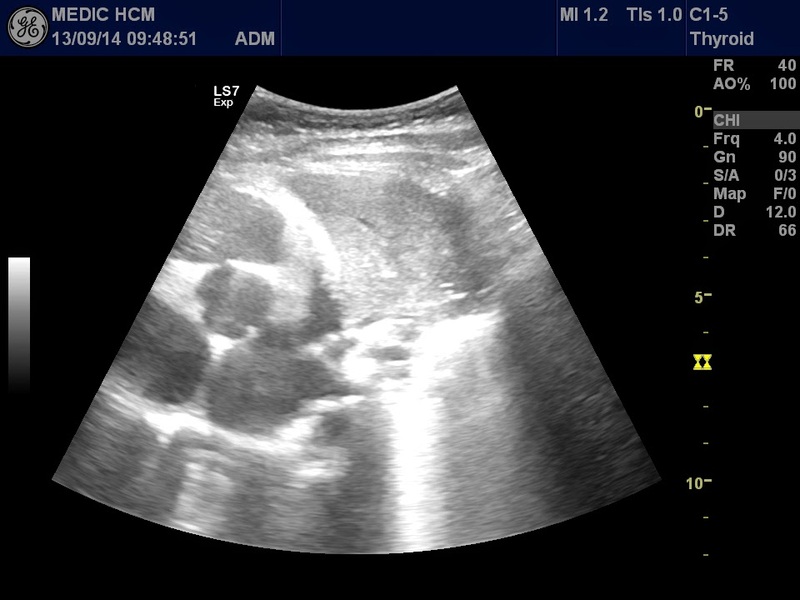 Discussion: An interesting case of PTC with appearance of many small cysts which make confusion to colloidal cysts. Clinical findings which helped to diagnose are tumor getting bigger faster on one lobe of thyroid. And ARFI elastoUS keeps the predictive role in diagnosing exactly for this case. BOY 5 YO 3 DAYS AGO FEVER AND COUGH. PEDIATRIC DOCTOR REQUESTED BOOD TESTS FOR RULE OUT DENGUE FEVER AND CHEST XRAY. RESULT RETURNED QUICKLY (SEE BLOOD TESTS AND CHEST XRAY). INFECTION, WE CAN RULE OUT DENGUE FEVER. 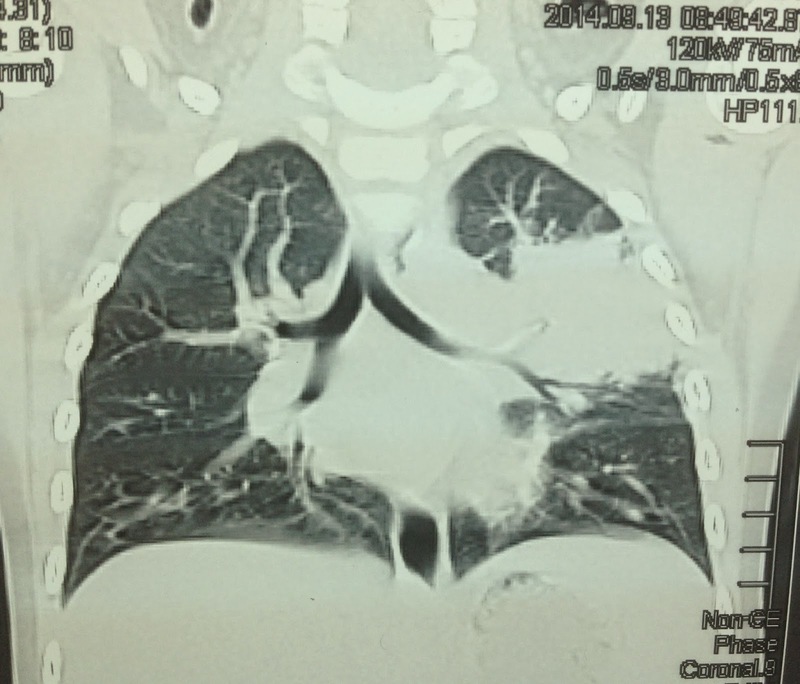 BUT THE CHEST X-RAY WAS ABNORMAL, ONE RADIOLOGIST SUGGESTED LUNG TUMOR. 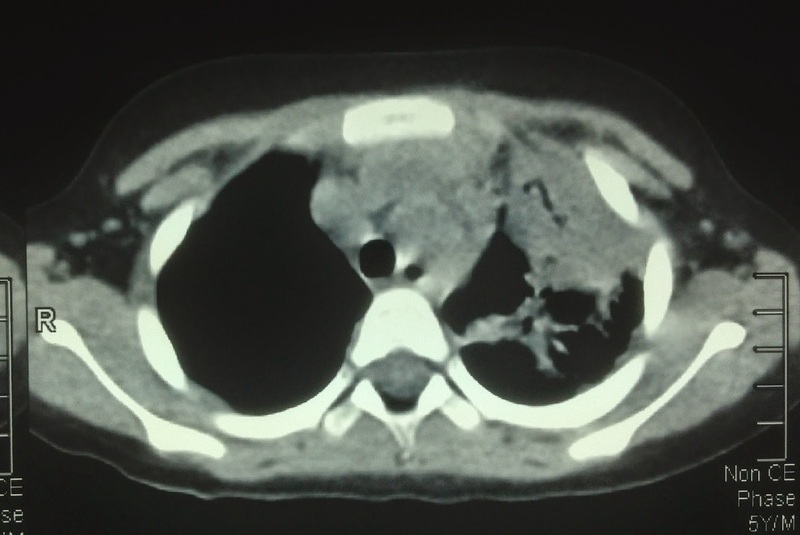 AND HE REQUESTED THORAX CT SCAN. 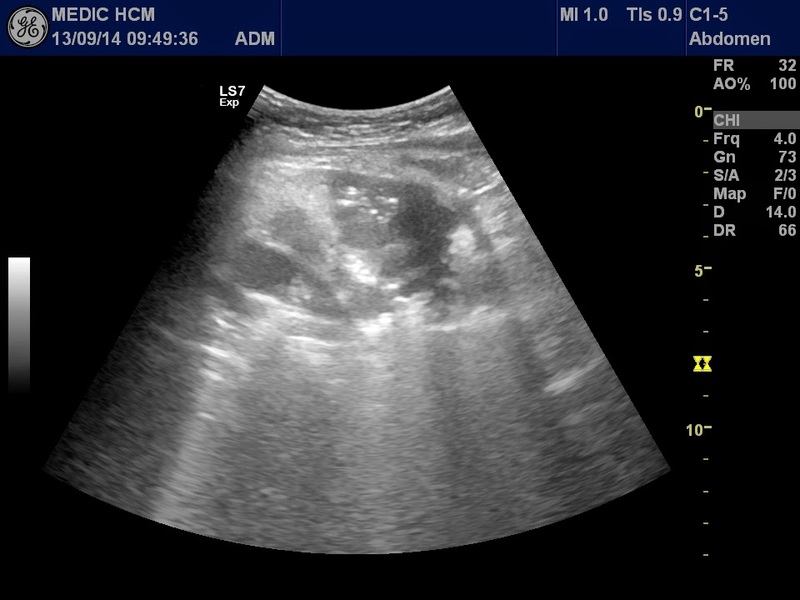 ULTRASOUND OF THE CHEST BY TRANSTHORACIC DETECTED THIS MASS AT THE LEFT LUNG WHICH WAS SOLID ECHOTRUCTURE LIKE HEPATIC TISSUE. 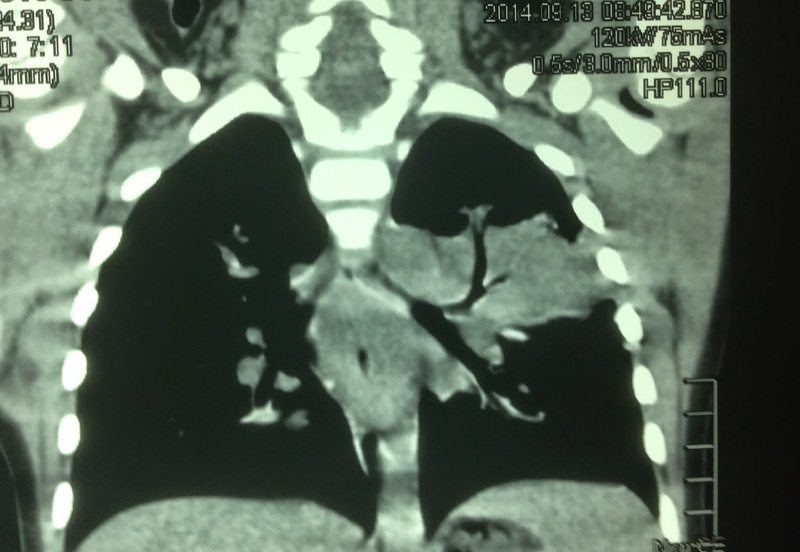 For make sure diagnosis we performed low dose CT Scan without CE (see CT pictures). 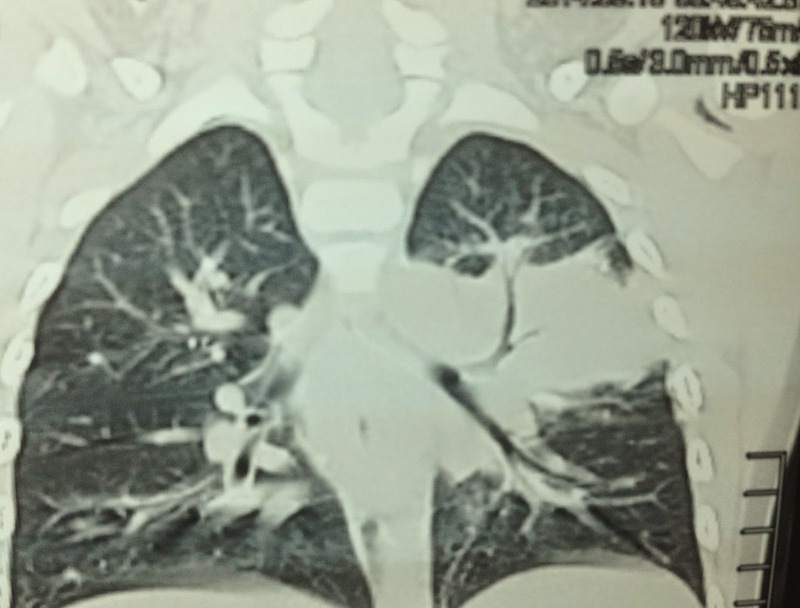 Radiologist reported that a lobular pneumonia in consolidation phase of the left lung. Antiobiotic treatment is in urgency. 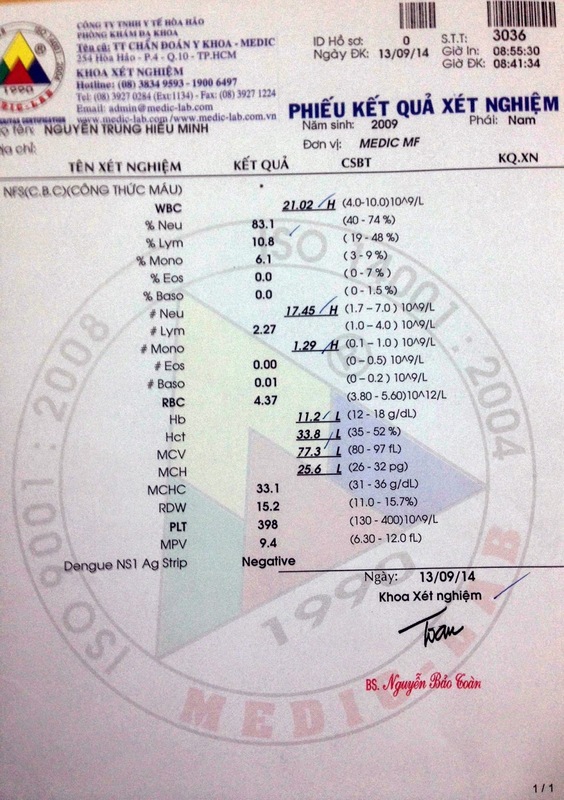 After one week treated with antibiotic, the clinical of patient recovered very well. CRP dropped to 32ng/mL. 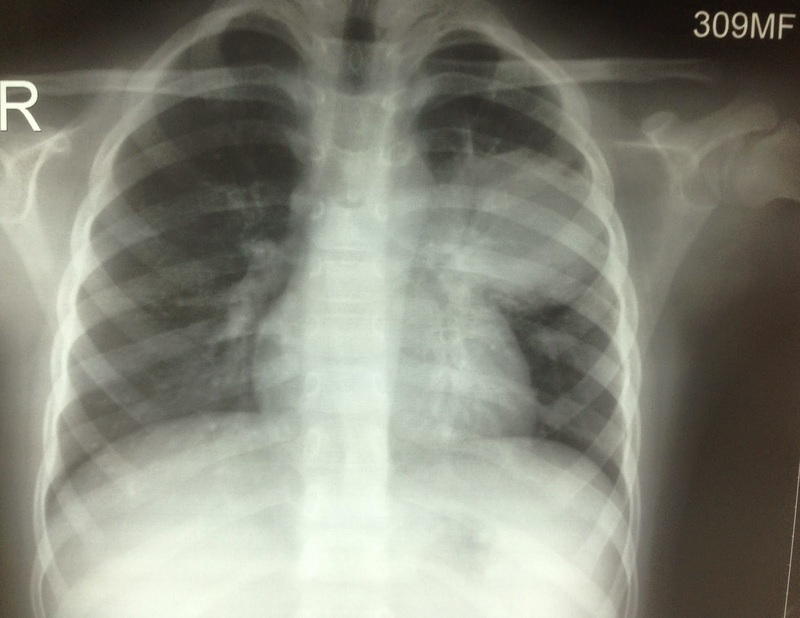 Chest X-Ray has got near normal status and lung ultrasound had changed structure. 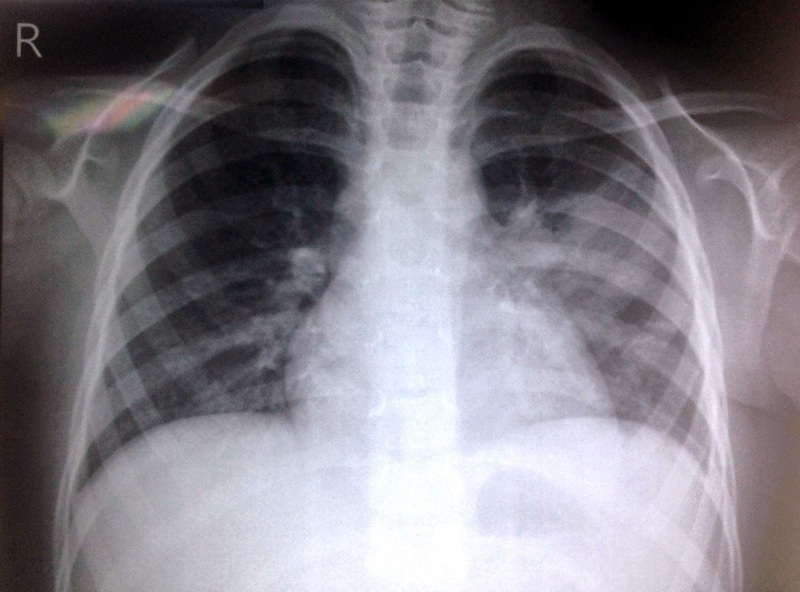 (See chest X-Ray and ultrasound pictures of the left lung). 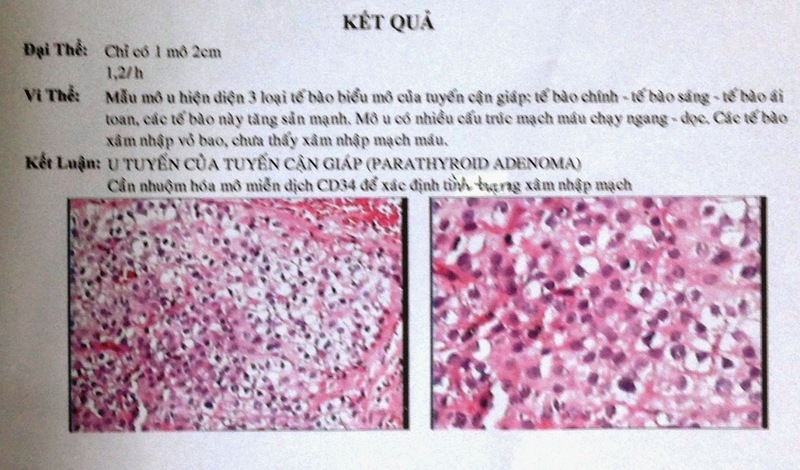 WOMAN 50YO, AFTER 5 YEARS TREATED HYPERTHYROIDISM AS STABLE STAGE, BUT BLOOD TESTS DETECTED PTH VALUE VERY HIGH AND HYPERCALCEMIA. 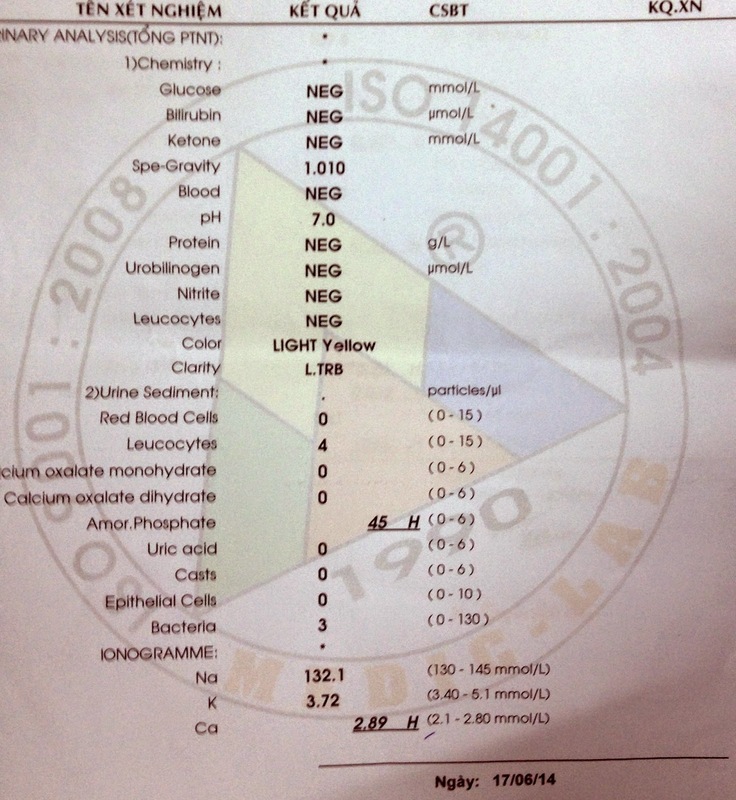 IT SUGGESTED HYPERPARATHYROIDISM (SEE BLOOD TEST RESULT). 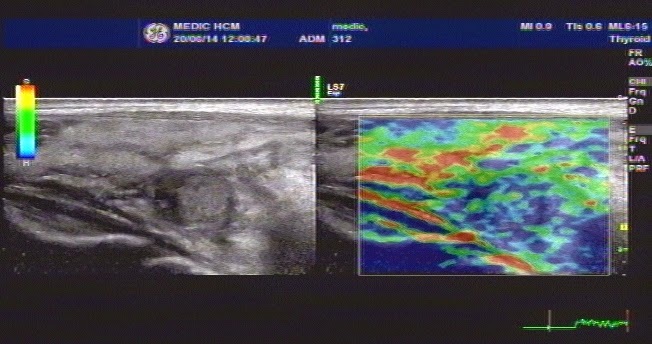 ELASTO, AND HYPOVASCULAR, SIZE OF 2 CM. 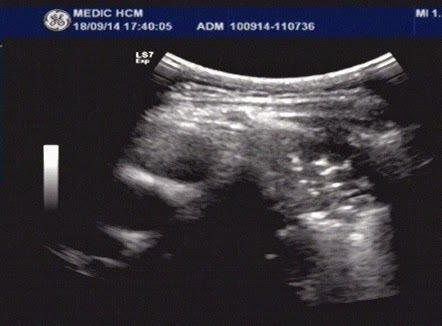 THYROID GLAND, SUSPECTING PTA, SIZE ARROUND 2 CM. IN PREOPERATION ENDOCRINOLOGIST REQUESTED GAMMA SPECT MIBI. BUT THE REPORT WAS NOT ABNORMAL ISOTOPE, MEANING NOT PTA. (SEE SCAN MIBI UPTAKE) . 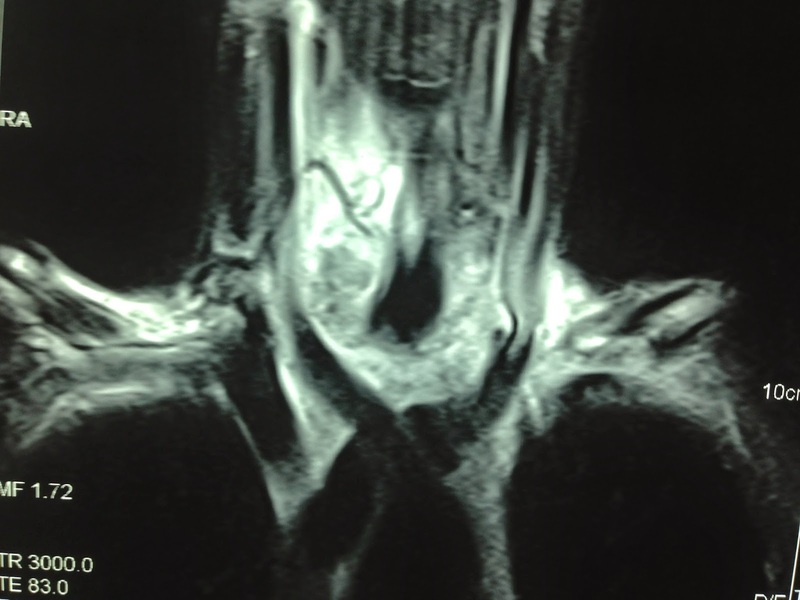 This case is very complexe; the clinical onset was hyperthyroidism , medical treatment was good response. But in biology blood test is evident about hyperparathyroidism. 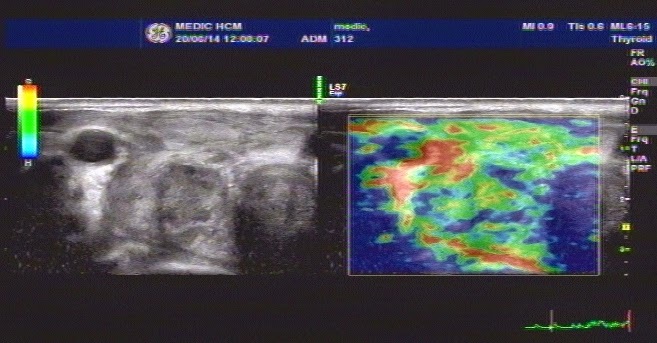 Ultrasound and MRI made the same diagnosis of PTA. 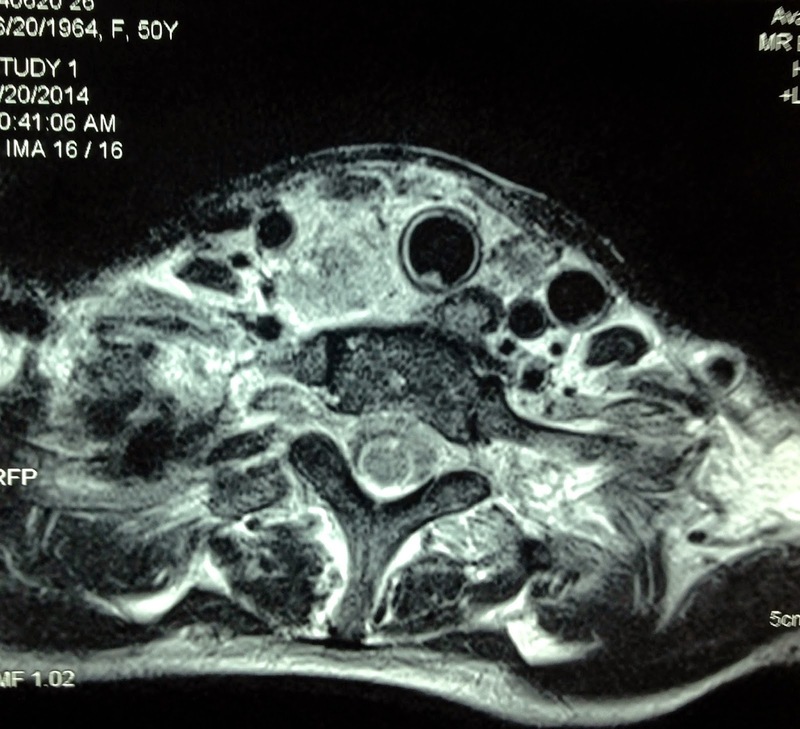 But gamma SPECT scan MIBI is negative; it cannot rule out PTA , so operation was done for remove this tumor. And pathologist diagnoses PTA ( see pathology report). 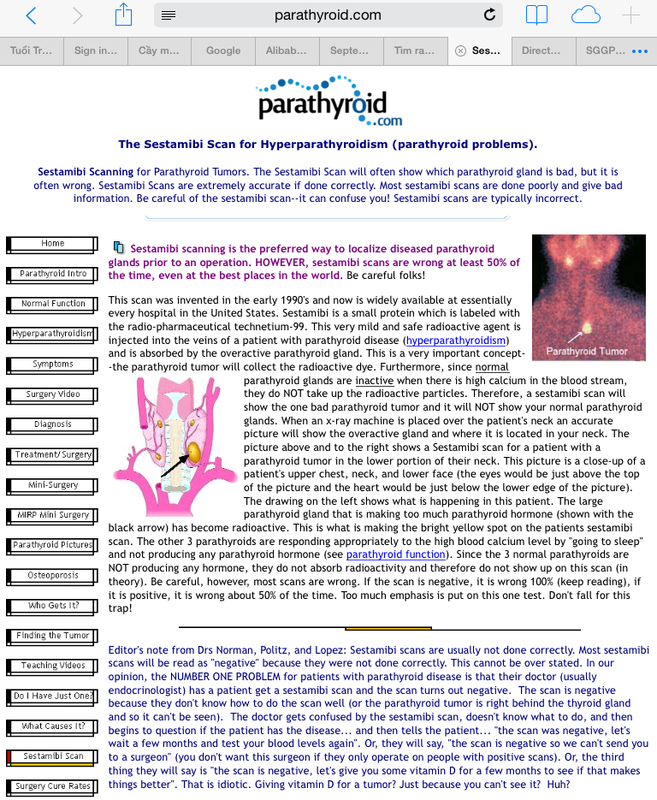 Review in internet: many cases with SPECT scan MIBI were negative.. And indication for this scan helps to make clear Indication and Interprettation..
For diagnosis PTA , the gamma scan MIBI cannot rule out clinical diagnosis.